The Hyundai Santa Fe Sport is back for 2018 with even more to offer adventure fans across the country. Find out why this small SUV packs a big punch. The Hyundai brand has been known for many years as the one that will pack in the features at the base price to make sure you have more of what you want for the ride when you head out on the road. This is certainly the case when you choose the compact SUV of the Santa Fe Sport that you want to enjoy when you head out on the road. This SUV may be riding on an aging platform, but it’s built with more features than ever for the same price, making it a value player for you to enjoy. 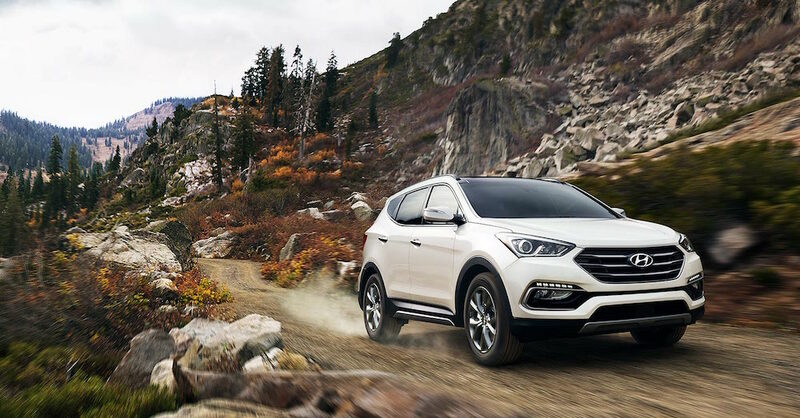 When you want a compact SUV that has more size, features, and power for the drive, you should take a look at the Hyundai Santa Fe Sport so that you can have everything you’re looking for. This SUV is one that brings you more interior space than the models from the competition while also giving you the benefits of a ten-year/100,000-mile powertrain warranty. If you move up the trims to find the one at the top, you might feel as if you’ve found some luxury features offered in an affordable SUV. Stop by your nearby Hyundai dealership and take a look at the 2018 version of the Santa Fe Sport. This new Hyundai SUV is one that brings you a new Value Package with gives you heated front seats and side mirrors, a proximity key with push-button starting, automatic climate controls, Apple CarPlay, and Android Auto. The models that have the Blue Link included offer you scheduled maintenance for three full years to make it easy for you to keep up with the maintenance needed and ensure your vehicle will continue to be able to drive on the roads in your area and offer you the ride you’re looking for. The world of compact SUVs typically offers you the same power as the sedan that underpins the vehicle. While the Santa Fe Sport uses a 2.0-liter turbocharged four-cylinder engine, it brings you 240 horsepower and 260 lb.-ft. of torque for the drive. You’ll also smile when you carry items to the rear of the Santa Fe Sport and enjoy the hands-free smart liftgate that will open automatically for you as long as the key fob is in your pocket and you’re near the vehicle. The 2018 version of the Hyundai Santa Fe Sport can be the right SUV for you to drive when you want value in a compact crossover SUV. Make your way to your nearby Hyundai dealer and take a look at what this impressive small vehicle can offer for your drive. This SUV is the small model that has the big personality to ensure you have the features, power, versatility, and comfort you’re looking for in the vehicle you drive. Take a test drive today and see if this SUV has everything you want when you’re on the road.